Wholesale discounts are available on orders of ten or more calendars; please contact us for details. Please read the page of shipping information before placing your order. Copies of the Stella Natura 2018 are available at a cost of $8.45. Please note that copies of the 2018 edition may not be combined with the 2019 edition when figuring discounted prices. Copies of the Stella Natura 2017 are available at a cost of $8.45. Please note that copies of the 2017 edition may not be combined with the 2019 edition when figuring discounted prices. Copies of the Stella Natura 2016 are available at a cost of $7.50. Please note that copies of the 2016 edition may not be combined with the 2019 edition when figuring discounted prices. Copies of the Stella Natura 2015 are available at a cost of $7.50. Please note that copies of the 2015 edition may not be combined with the 2019 edition when figuring discounted prices. Copies of the Stella Natura 2014 are available at a cost of $7.50. Please note that copies of the 2014 edition may not be combined with the 2019 edition when figuring discounted prices. 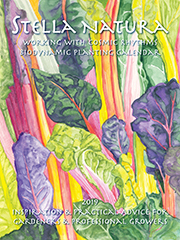 Purchase one copy each of the Stella Natura Biodynamic Planting Guide and Calendar 2014 and the Northern Hemisphere Astro Calendar 2014, and receive a 50% discount on the set (discounted price for the two calendars will be $15.95). Each complements the other and the two make a wonderful gift for anyone interested in becoming more aware of the cosmic dimensions of nature's life and learning to live in harmony with its rhythms. Please note: shipping costs for multiple sets or sets sent by international mail may be $2.50 or more higher than shown in shopping cart, depending on customer's address. You will be charged the actual cost of postage and shipping materials; if you would like to be contacted with the actual cost before your order is shipped, please indicate this in the note field of the order form. Copies of the Stella Natura 2013 are available at a cost of $7.50. Please note that copies of the 2013 edition may not be combined with the 2014 edition when figuring discounted prices. Copies of the Stella Natura 2012 are available at a cost of $7.50. Please note that copies of the 2012 edition may not be combined with the 2014 edition when figuring discounted prices. Copies of the Stella Natura 2011 are available at a cost of $7.50. Please note that copies of the 2011 edition may not be combined with the 2014 edition when figuring discounted prices. Copies of the Stella Natura 2009 are still available at a cost of $7.50. Please note that copies of the 2009 edition may not be combined with the 2014 edition when figuring discounted prices. You may still purchase one copy each of the Stella Natura 2013 and the Northern Hemisphere Astro Calendar 2013 for a discounted price for the set of $15.95. Please note: shipping costs for multiple sets or sets sent by international mail may be $3.50 or more higher than shown in shopping cart, depending on customer's address. You will be charged the actual cost of postage and shipping materials; if you would like to be contacted with the actual cost before your order is shipped, please indicate this in the note field of the order form. You may still purchase one copy each of the Stella Natura 2012 and the Northern Hemisphere Astro Calendar 2012 for a discounted price for the set of $15.95. You may still purchase one copy each of the Stella Natura 2011 and the Northern Hemisphere Astro Calendar 2011 for a discounted price for the set of $14.95. You may still purchase one copy each of the Stella Natura 2009 and the Northern Hemisphere Astro Calendar 2009 for a discounted price for the set of $14.95.